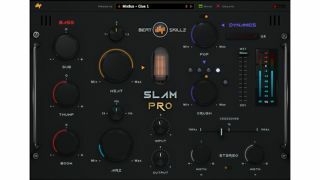 New from Indian plugin developer Beatskillz, Slam Pro is touted as a "Mix Phattener Processor with control over the Bass Section, Presence and Air." Sitting somewhere between a bus processor and a channel strip plugin, Slam Pro is a potential Swiss army knife in your VST, AU or AAX collection. So what's onboard? Starting on the left with the Bass section, Slam Pro gives you three controls - Sub, Thump and Boom - to add or remove low frequencies and shape bass transients and sustains. Next, the Heat dial offers three types of saturation, and Airz tweaks a high-frequency shelf at one of three center frequencies. The Pop control is typical Beatskillz, giving you one control to affect one process - compression in this case. Results may be hit and miss with this one, we'd expect. The Crush control acts more like a maximiser, adding loudness again through the use of a single parameter. Rounding off the effects is a Stereo Expander, offering width adjustment for low, mid and high parts of your signal. Rounding the control panel off are input/output gain controls and a single wet/dry mix control. As ever with Beatskillz, this plugin isn't a surgical mix-finisher, but seems most competent in adding character and personality - and a bit of what's lacking - to single tracks. Slam Pro is available at the introductory price of $79 until the end of September from the Beatskillz website, and buyers currently get a free copy of the company's paid-for Slam Dawg plugin when purchasing.